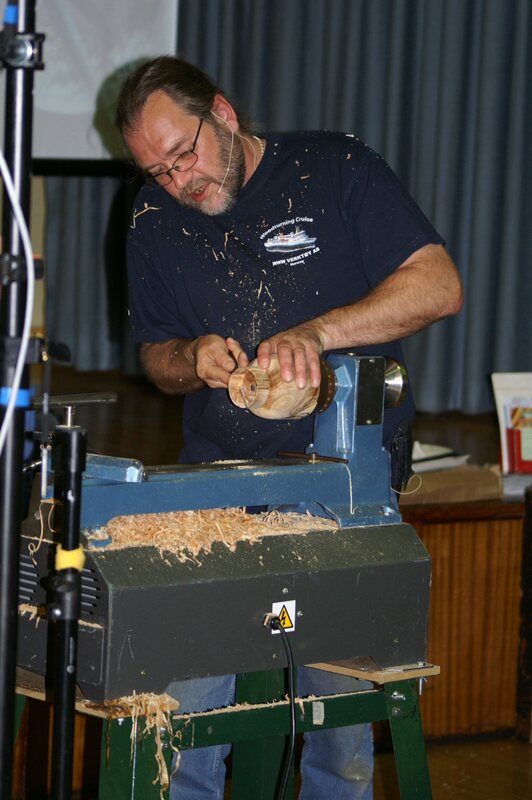 Mark’s demonstation was to create a three legged vessel out of apple – this is great for demo as it showed hollowing, carving, painting and gliding. Mark highlighted the importance of wearing a facemask – safety first. Mark first put the piece of wood “parallel grain” between centres and using a bowl gouge created the rough shape of the vessel. Also Mark created a siggot for holding the vessel for the next stage. 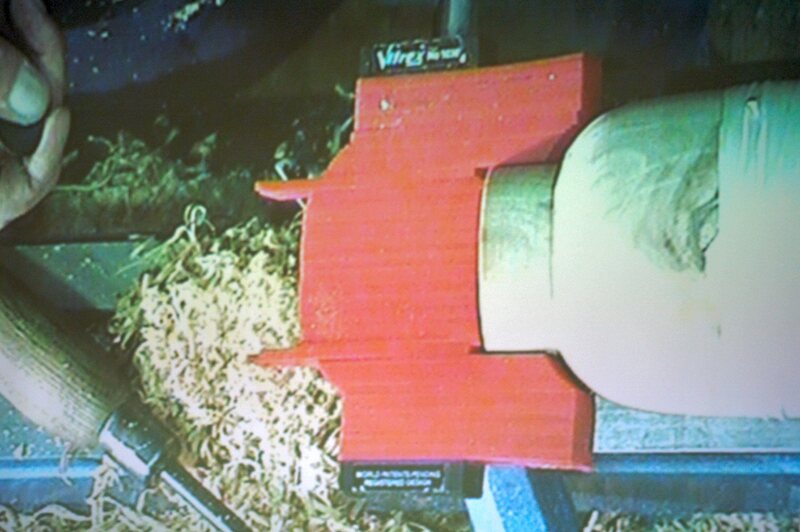 Mark mounted the piece of wood into the chuck and refined the shape using a bowl gouge and then a cabinet scraper. Mark highlighted that he uses a cabinet scraper as it gives him more freedom to create the shape without the need for a toolrest. The scraper must be used in a trailing fashion in relation to rotation. He highlighted this is great for getting rid of the “pimple” in the bottom of hollow forms and bases as well. Once the basic shape has been formed on the outside, mark turned to the inside. First he bored a depth hole using a tool called a spoon bit borer (made in Germany, where the “Spoon” on the head is tapered so not to catch in the hole). 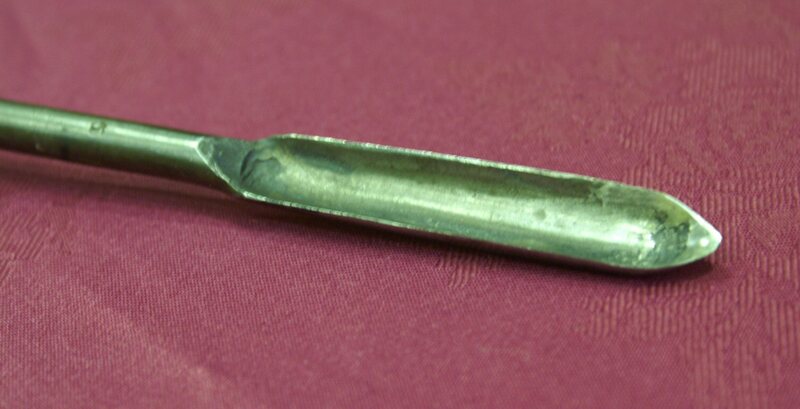 This tool is not made anymore as it needs to be handmade (not cost effective). 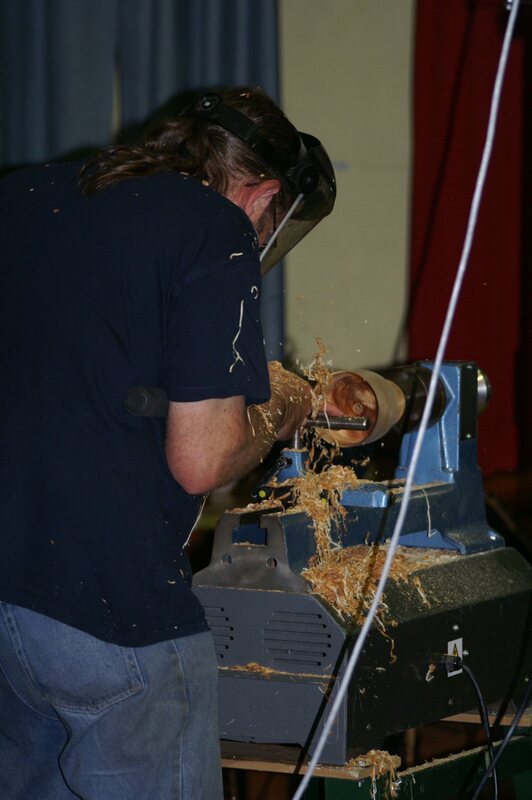 He used a Munro hollowing tool to remove the waste. 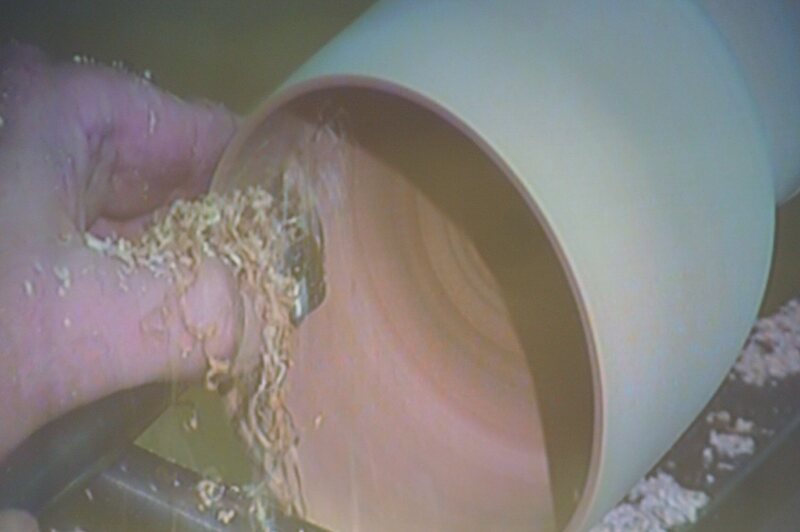 He gave us his advice about hollowing, instead of using a sweeping cut, he recommends taking the waste out in layers, keeping the bulk of the wood at the base and only taking out when it is needed to be removed. This is to give the vessel/walls as much support as possible for as long as possible. 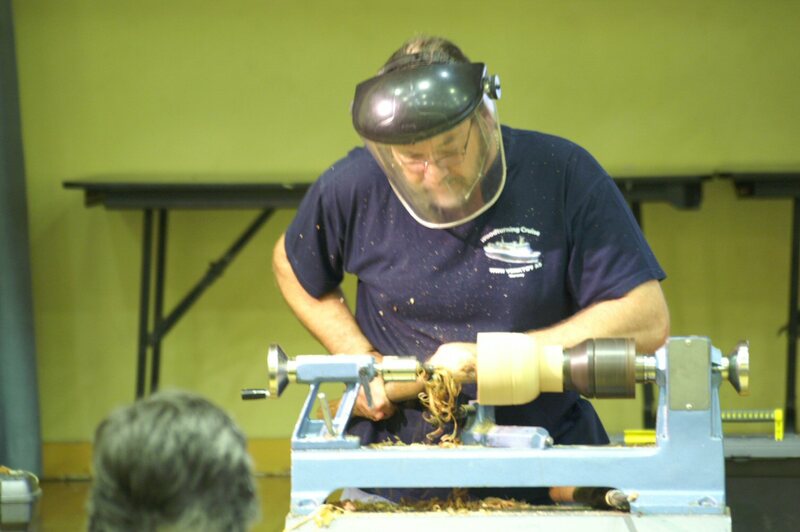 Once the inside of the vessel was finished, Mark reversed the piece and started to remove the spigot and created a “bowl” shape in the base to create the shape that would become the legs. 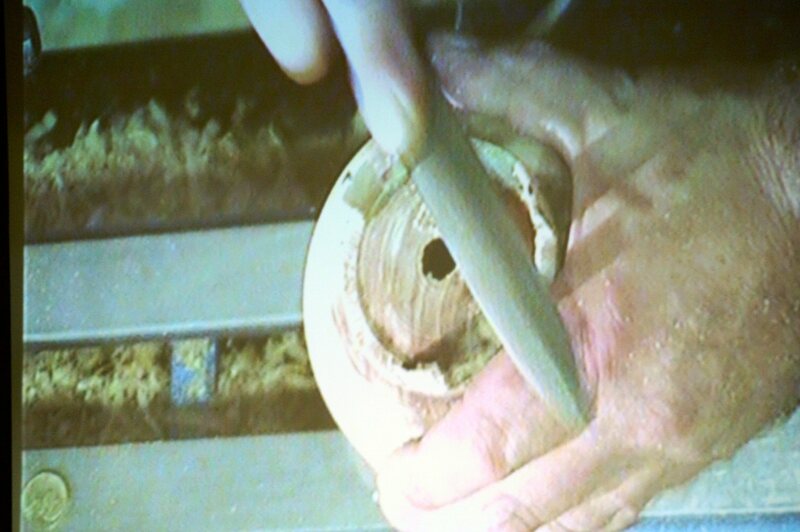 This was achieved using a bowl gouge and then the munro hollowing tool to reduce the thickness of the wall. Mark wanted to follow the curve of the outside of the vessel through the legs and round to the base, He used a flexible profile/contour tool to test whether the curve flowed through smoothly. The next step was to remove the walls of the base to create the legs, an odd number is always more pleasing on the eye. Mark used a Japanese trim saw (cuts on the pull stroke). The base was cleaned up with a rasp. 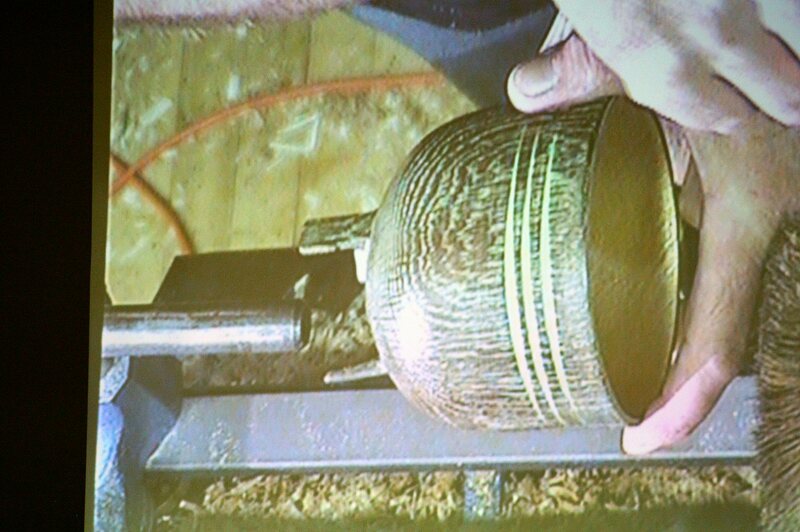 Once the Vessel has been cleaned up, mark wanted to ebonise the vessel, to do this he used a type of gas called “MAPP”, it burns at a much higher rate than butane or propane. This ebonizes the timer without stressing the wood (causing the wood to crack). Once the wood is burnt, it was sprayed with water to extinguished any embers and then the burnt area was polished. To turn a self centring chuck into an eccentric chuck with about a 4mm gap. Take out the chuck jaws from the chuck (remove the safety pin if needed) and re-sequence the jaws to 1, 3, 4 & 2. This pushes jaw 2 out from the rest. 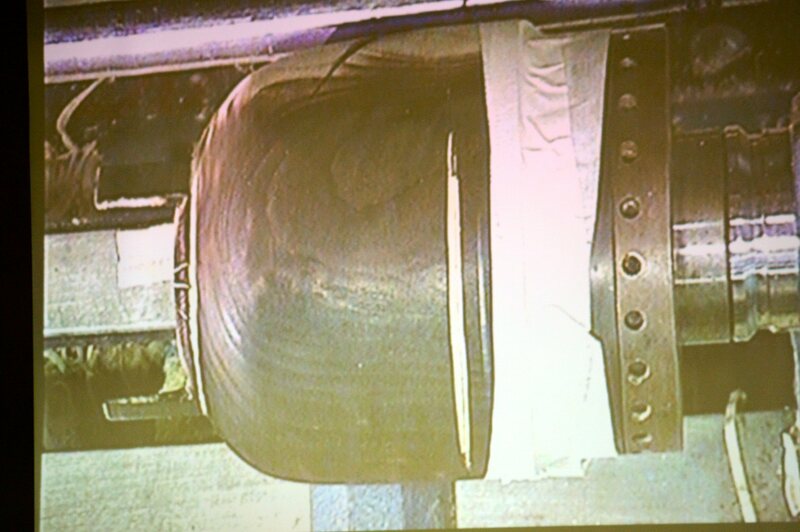 This technique allowed for strips to be cut into the wall of the vessel. Mark gave a quick advice about guilding. He stated you much always put a base coat of red acrylic paint. And then the water based guilding glue/size (watered down PVA glue). For the easiest results use gold leaf transfers and then a brush to move the gold leaf around.